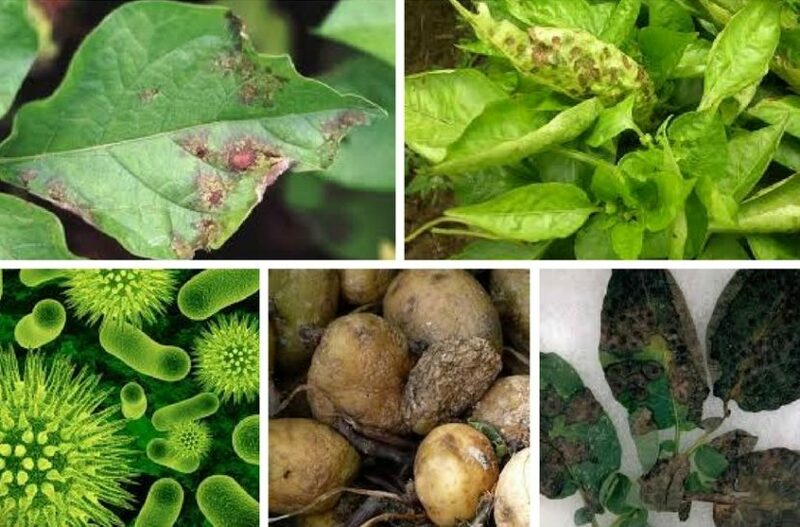 Diseases on garden plants are caused by fungi, viruses, bacteria or inanimate factors. The plants are more likely to get infected if the soil contains too much organic matter (e.g. excess nitrogen from fertilizing), in bad weather conditions and if the seedlings were stressed. Therefore you have to strengthen the crops with various solutions on time. The majority of fungal diseases appear in one plant family. The preventing and healing measures are different accordingly, therefore they are described separately. This disease attacks fruit vegetables, endive, radicchio, legumes and bulb vegetables. We can recognize them by concentric circles in spots that appear on the stems, leaves and fruits. Make sufficient distance between rows to enable air flow and fast drying. Strengthen the plants with solutions from milk, apple cider vinegar, elder or chamomile. Heal the plants with sage, thyme or horsetail tea. It attacks the nightshades: potatoes, tomatoes, peppers, eggplants. It can be recognized by grey-black spots on the stem, leaves or fruits. Fertilize moderately (when the potato blight appears frequently, plant the nightshades to the second rotation field). Strengthen the plants with different solutions. Have long enough rotation periods. Transplant seedlings of proper size; if they are too big, they have difficulties with changes. Do not touch moist or wet plants. Plant potatoes as far from tomatoes as possible and do not work on both crops simultaneously. Remove the lower leaves of tomato plants and the suckers; and thin the leaves (up to 5 a week). Prevent the blight with solutions (sprays) from milk or chamomile tea. Heal with solutions from onion, garlic, sage or horsetail . Remove the plants that are seriously ill. It attacks almost all the plants, most often parsley, radicchio and squash. It can be recognized by grey spots on the foliage. Plant basil in between crops and bulb vegetables in the vicinity. When the mold first appears, wash the plants with gentle water jets. When washing doesn’t help anymore, cut the parsley and radicchio and leave only the inner foliage. Heal with solutions from garlic, apple cider vinegar, horsetail, elder leaves, nettle or chamomile . It attacks almost all plants, especially beans, pepper and leafy vegetables. It can be recognized by powdery white covers on the stems. Make enough distance between rows to enable air rotation and fast drying. A long enough rotation period is important. Use prevention solutions from sage, chamomile or compost . Keep the garden clean and remove the damaged or decayed parts of plants. It attacks almost all plants. It can be recognized by the decay of leaves and fruits, and grey-green mold on the damaged spots. Use mulches that prevent the leaves and fruit from moisture. Use solutions from sage, chamomile or compost . It attacks only lettuce. It can be recognized by yellow angular spots between the leaf veins. First they appear on the outer leaves. The spots turn to brown later. Have a long enough rotation period. Grow lettuce in the second or third rotation field. Prevent by solutions (sprays) from milk or chamomile tea. Heal with solutions from onion, garlic and sage . They attack several vegetable plants, most often cucumbers. Prevention with solutions (sprays) from milk or chamomile tea. Healing with solutions from onion, garlic and sage . The attack is difficult to stop; plan with the risk in mind and prepare additional seedlings in case you need to plant new crops. This happens to seedlings and young plants. The disease can be recognized by decaying of plants in characteristic circles. Use healthy substrates that don’t contain too much organic matter (turf). Soak the seeds in sage tea and water the substrate fro sowing with sage tea. Water moderately and evenly (with a sprayer). Keep hygiene in the greenhouse high and air regularly. Prick the seedlings out in time, or sow thinly to leave enough space between the seedlings. When the seedlings start to damp off, pull out the damaged plants and their neighbors, dry the remaining seedlings out, water with sage tea and then reduce watering and increase airing. Rust attacks various plants. It can be recognized by the spores when touched, not to be misinterpreted as bacterial infections. Virus disease can be recognized by wrinkling, curling or twisting of leaves (that are not caused by lice), unusual blights and colors on the leaves. Viruses are spread by sucking insects; drive them away, also by cultivating beneficial organisms. They get spread by the seeds and plant parts as well; purchase only certified seed material and seedlings. There are a lot of viruses in the tobacco; smokers should wash their hands well before working in the garden and shouldn’t smoke there. Take care of the plants’ health; strong plants get less harmed by viruses. Bacterial diseases can be recognized by drops and watery circles in blights and spots. They are frequent in moist weather. The diseased parts of plants have an unpleasant odor, and the plant and its fruits rot. Take care of the plants’ health, as weakened ones het harmed by the bacteria quicker. Fertilize appropriately and keep the soil soft. Bacteria get spread by the seeds and plant parts as well; purchase only certified seed material and seedlings. Beans are very sensitive and should not be planted until it is warm enough. Make sure there is enough distance between rows for air flow. Black rot of crucifers causes triangular spots from the edge of the leaf towards the stem, which are yellow at first and brown later. Its attack can cause the plant’s decay. The only help is taking care of the plants’ health.